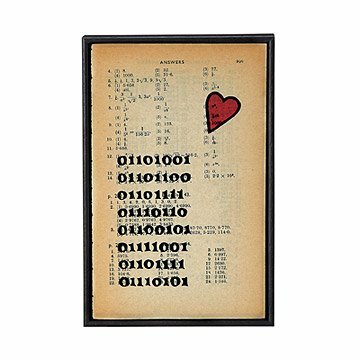 This art piece spells out "I love you" in binary code, printed on a page from a vintage math textbook. Designer Louise Verity knows that sometime love can only be expressed in a base-2 numeric system. That's why she created this art piece that surely has math nerds everywhere swooning. For her canvas, she uses a page from a vintage math textbook. Onto that, she prints her text with a hand-drawn font--including the message "I love you" written in binary code--using black ink, and gives it a pop of color by hand painting the center of the heart. The art piece gets a high definition display in a black wooden frame crafted by a family business in Northamptonshire, England. The frame has no glass in order to open up the tactile pleasure of an antique book page, and it is thick enough to be displayed freestanding on your desktop as well as being ready to hang on the wall. Handmade in the United Kingdom. Louise Verity is the owner of Bookishly, and lives in Northamptonshire UK with her husband and young son. She likes John Hughes movies, cake and the smell of new books. She dislikes Marmite and ironing. Bookishly started in 2009 with an antique French dictionary and an inherited set of water colour paints. Now the prints are created by Louise’s dedicated team beavering away in the workshop getting orders out each day. Louise spends a lot of time hunting through old bookshops looking for inspiration and for books to give a new lease of life as a little piece of art. There’s a few things that make the Bookishly range different to other typographic collections. The wonky old font is exclusive, based on Louise’s hand drawn lettering. You won’t see it anywhere else! The framed prints are mounted into Bookishly’s signature block frames, made locally here in Northampton UK. There’s no glass so you can feel the lovely old page and they can easily be sent all over the world. They often are! Each book page print uses an original vintage book page, making each one a little bit unique. Bookishly designs have been featured in number of national and international magazines and blogs, including The Huffington Post, Apartment Therapy, Ideal Home and Stylist among others. My husband is the hardest person to buy ANYTHING for. He's into computers, so gadget-type gifts are usually bought before I have a chance to get them for him. So, for our first anniversary, I wanted to find something special. I had this dilemma because he's not usually one to use paper, which is the traditional first anniversary gift ("That's what your phone is for"). I came across this beautiful print after about a month of searching, and decided to get it for him. When I gave it to him on our anniversary, he absolutely loved it! He immediately cleared a prominent spot on a shelf by his desk at home where it's right at eye level. I even catch him looking at it quite a bit! Thank you!! Well made, unique product! Exactly as expected. I'm very satisfied. This was a valentines gift for my boyfriend. It is a supercool geek thing. I think the price is a little steep for the light frame and paper. But I understand the work put into it so I got it anyway. I did expect a wooden frame. Something a little heavier. But satisfied nonetheless. Great concept. Quality of frame was a bit lackluster. Overall a lovely gift. Husband loved it. Great gift for true geeks! Sweet mssage to my husband in his own laguage about how crazy I still am for him. I gave this to my software engineer husband for Valentine's Day. He could actually read it and verify what I just trusted that it said! He took it to put up in his cube with the rest of the engineers at work. I bet they were jealous. :-) I got good wife points.